It all began in the dusty lifeless town of Lancaster, with extreme winds that carry the tumble weeds across the hot cracked asphalt. The white Adidas shoes on the telephone lines purchased at the Payless ShoeSource are a reminder of the lack of success. There’s nothing there except unemployed college dropouts who have many offspring who will go down the same road. Those who are employed are the lucky few. They’re the ones who want to break the never-ending circle and go to college. But most of the time, that job was just temporary because those few that do graduate know they can leave this ghost town, and they take the first bus out, leaving nothing but a trail of dust that goes on for miles across the dead Mojave desert. I was fortunate that my parents saved me from a life where being ambitious is becoming the manager at Payless ShoeSource. I spent the next chapter of my life in a place I am proud to grow up in: The wonderful town of Ventura where surfing is not a hobby; it’s a lifestyle. It’s how people talk, walk and dress. It has this relaxed feel to it — the sound of crashing waves and the fresh sea breeze. Day and night are nothing alike. The day is colorful and full of life; the buildings are colorful and are spread from sea to the mountain; and the beach is always full, looking like a 1950’s Coca Cola poster. Ventura is not just limited to the beach. It’s next to a beautiful mountain. On top, there are the iconic “Two Trees”, which you can see the whole city from. Although there’s all the commotion below, you feel isolated and alone, like there wasn’t a city for hundreds of miles. It’s the best place to watch the sunset. There is nothing like it in the world. The night is much more quiet. I could take a walk on the beach and hear nothing but the crashing tide and see maybe one or two silhouettes of people, outlined by the moon. Main Street at night has a sense of liveliness, even though it’s less than the day. It must be the bright neon lights and all the meter parking that is completely filled, even after shops are closed. As great as this town is, I am not the type of person who can live in one place his whole life. 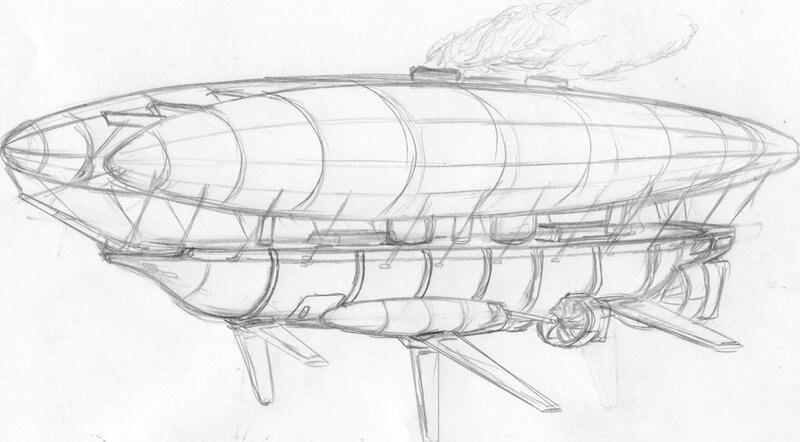 After College, and winning the Mega Millions a dozen times or so, I would have a custom-built airship I would live on that is basically a flying aircraft carrier, but a little more complex. It wouldn’t be all modern and futuristic; it would be held up by two large balloons that look like they came off a blimp, attached by 100 feet of thick rope like the ones used to tie a cruise ship to a dock. The balloons would be just the right height so I can take off in either of the two planes I would have. One of the planes would be a HU-16 Albatross, a large sea plane that could carry a lot of cargo. It would be military green with a 1950’s pin-up girl with red hair riding a large bomb. The other plane would be a P-51, with a pair of white sharp teeth and a red mouth toward the propeller. A little behind the mouth would be a pair of eyes with a fierce look to them. It would be painted the same tone of green as the cargo plane. The planes would perfectly fit the overall theme of steam punk meets sky captain of tomorrow. Any metal on the airship would be either copper, bronze, or gold. And anything else would be a dark-colored wood. The outside of the ship would be rough wood, the wood used on a pirate ship, but the inside would be detailed refined wood with fancy floral engravings. Polished copper pipes would be visible through the halls and outside of the ship, and two large bronze smoke stacks near the control tower would be used to collect the clouds, turning them into steam and using it to power the ship. When I’m on my ship, I would wear khakis with a brown leather jacket, along with aviator goggles around my neck just to add to the feel. I would only do this on my ship, because it would already be strange going places by old planes. The seaplane would allow me to go anywhere coastal and my P-51 would allow me to fly to any airport. From the airport, I would take the much more conventional, but less adventuress, method of transportation known as taking a taxi. Transportation would be inconvenient but limitless. I could go anywhere in the world, and that’s what would be so great. I wouldn’t even need to pack bags, because I could just take my ship with me. Once I got married and had kids, I would live on the Ship until the first one turned 5. Then, I would ask them where they wanted to grow up. It could be anywhere in the world; I would then move there so they could have a great place to call home while growing up like I did. I would live in that town for the rest of my life because it is the end of my adventure and the start of his or hers. I would stay there, so when they come back and visit they will remember the great times they had at their old home where they spent the greatest years of their lives. Wherever it is, I know I will be happy because all I would want is for my children is to have a good life, like my parents have for me. Whether it’s the snowy mountains of Colorado or the cherry-blossom filled streets of Japan, I will gladly spend the rest of my life there.